Thank you to Madame Payne for her interview with KPS French Language Assistant, Mégane Lesuisse. Madame Payne: You arrived at KPS to commence your French Language Assistant position at the start of this year. What motivated you to apply for the position? Mégane: Australia has always been a dream for me since my early childhood. After finishing my master’s degree in English Linguistics and Language Acquisition, I wanted a gap year to fulfil this ever-present dream. Combining this traveling dream with my passion for teaching was just the perfect opportunity for me. I applied with little hope as there were only 11 positions available, but here I am! Lucky to be working in such a good school. Madame Payne: What is your role as French Language Assistant at Kew Primary School? Mégane: My role is basically to be myself, an authentic French person able to share my culture, my language and my experiences with the students. Since arriving, I have been teaching Grades 3 to 6 with you, Madame Payne. Together, so far we have prepared and delivered a variety of interesting topics: from zodiac signs and French fairy tales to the family and the Vikings. Students seem to enjoy having a French assistant in the classroom who can mainly help them to work on their pronunciation but also on their vocabulary and writing in French. Anecdotally, when I first wrote on the board with my French handwriting style, some pupils copied it as if it were another alphabet! I found that rather amusing but it also reveals how having a French assistant can bring spontaneous examples of French culture directly into Australian classrooms. Madame Payne: As you mentioned, you have been working with Grades 3-6 at KPS. How do you compare your experience of Australian primary school education with that of your home country in France? Madame Payne: What has been a highlight of your stay so far? Mégane: Being a French language assistant has meant working as a team with the teacher. This was completely new to me and it has proven to be a really satisfying experience. Being able to share my French teaching knowledge and experience with an Australian-trained teacher reinforced my desire to teach. Madame Payne: You have been here for over 6 months now. What do you hope to achieve before the conclusion of your assistantship at the end of the year? Mégane: My goal as an ambassador for France is to promote French language and culture. I would like to encourage the students to continue to be curious and enthusiastic about learning French. I want to show them that French is not just grammar rules and vocabulary words they need to learn but that there is an entire culture to discover. 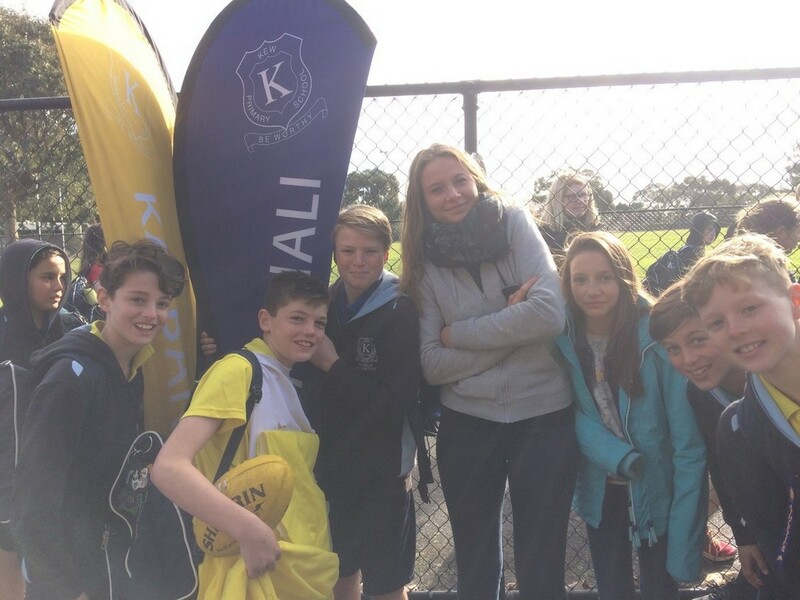 In reaching this goal, my two sisters from France ( aged 18 and 12) visited KPS on the recent athletics day. I was pleasantly surprised that the KPS students spontaneously approached them for a chat, most of the time in French! Isn’t that proof of success? Madame Payne: It has been a pleasure working with you to date, Mégane and I look forward to the following five months of further fruitful collaborations. Merci à toi! This entry was posted in Staff and tagged French, languages, teachers by Kate W. Bookmark the permalink.